I am sure that everybody would agree with me in hoping that too big a disaster has not befallen Blakstone, who lives close to the recent devastation and is such a generous and erudite contributor to this forum. B. do please let us worried folk know how you are! I am sure there are others but they never divulged their location. And from the other side of the world - we are concerned too. Silver Lyon speaks for many of us. At the risk of being politcially incorrect, my prayers are with them. I fear we cannot expect to hear from Blakstone, IJP, or any other members from New Orleans (or any coastal communities from the affected states) for some time. New Orleans is isolated, without power or communicatons (other than the satellite trucks of the media) and undergoing complete evacuation. All evacuees and those who left before the storm, unless with frends or relatives, will be in shelters and may be without internet access for a considerable amount of time. We can hope they have survived, as most others have, but they may have lost everything and might have to rebuild their lives from scratch. I have lived in the affected area and am familiar with many of the devastated communities; I have been through a number of hurricanes in earlier years, and know how vulnerable the area is. From what we have all seen on television, I can appreciate the scope of this disaster, and am of the opinion that for once the media reporters, who usually have a tendency to exaggerate bad news, do not have the words to describe the situation adequately. I am thankful I am not there now. are with blakstone and all of those in need along the gulf coast. The internet is a constant reminder that we are a community and we all feel for those affected by the disaster. I am stunned and heartened by the concerns and prayers of forum members for my safety. I (and my family) was able to escape before the devastation that befell my beloved New Orleans, and I hope that members will strive to find the kindness and decency that thrives there still in defiance of the hideousness shown in all media - acts of violence for which I feel personally ashamed. Recent but unconfirmed reports say that my neighborhood was unaffected by the floodwaters and was - we hope - in the 10-20% of New Orleans which remains above water. It now appears likely that residents will not be allowed to return for 1-2 months, so I will not know until then if my library - or anything else - has survived. In the meantime, we will be lodging with relative in another state. And I will, as time permits, be checking in here at the forums. They have given me great delight always and great diversion in times of strife. I turned to them tonight for the latter - a simple distraction from a surreal week - and I am, I iterate, grateful for your concern, overwhelmed by your compassion and, all pc aside tmockait, blessed by your prayers. Blakstone: Wonderful to hear of your safety and that of your family. Your library has been one of my concerns, although secondary to your safety, but if there is any bright spot there it is that looters do not concern themselves with books. Congratulations and welcome back. Hopefully some of the others will be as fortunate. Your posting brightened my day-it is so good to know that you and your family are safe. I echo others' sentiments to say that our thoughts and prayers are with you and your fellow New Orleans residents. Hopefully, we will hear from others from Scott's list as they are able to return to such diversionary tasks as checking this website. Glad to hear you and yours are safe. We'll keep praying for the rest. I�m moving this post to the New Members� Forum so that more can participate in this thread. Living in a country where the climate rarely shows its teeth, it was hard for me to comprehend the news last evening concering the devestation. My thoughts and prayers are with those who have found themselves in the eye of the storm. I'm delighed to hear Blakstone is safe and very very sorry that your precious books (and other possessions)are in peril. Have been out of town for work all week (and also completely out of touch.) I knew there was a hurricane but only recently heard the extent of it. I can't even comprehend such devestation, with so many lives and livelihoods destroyed in one fale swoop. My families thoughts and prayers are with New Orleans, that they may hopefully rebuild. Blakstone, glad to hear you made it out alive, hope the other members are o.k. also.. , G.
Very, very disturbing fotos and news. Is this really America? I wish all the members concerned the very best out of my heart! I too was thrilled to hear that you and your family are well, Blakstone. It is heartening to hope that you will have a home to return to. You will be heartened to hear that the New Orleans Museum of Art is intact and unaffected. The guards refused to evacuate and leave their charge unprotected! They have been living there since in air-conditioned and emergency-generated semi comfort! In the weeks to come, please ask if there is anything that anybody can do to help! Good to know you made it out. Best of luck with your library. The one tip I have on that is that if books are severely wet, freeze them. Others may have more helpful advice. Such devastation! Good friend lost his New Orleans home to the storm, happily, his ex-wife had the sense to evacuate with the kids (no word on her home yet). Endured the three storms here in Orlando last year, but there is no comparison to the destruction and loss of life from this one. Sending my sincere sympathy and prayers for all. B so happy that you and yours are safe. Times like this draw us, some of us strangers together. My husband and son-in-law are leaving our home, in Florida today to travel to the area hit, taking food. Last weekend my son-inlaw went by himself and cooked 5000 hotdogs. An elderly lady with a baby in a shopping cart, came and helped him all day. There they were young and old, black and white side by side. Thanks go to the forum for moving this to the newbies forum where we can share our thoughts and prayers with you. Have not visited since Katrina hit and to be honest have been glued to the news channels in disbelief of the disaster!! Our family lived in the Northridge/Chatsworth area during the big earthquake and lost many "things". I refer to them as things as, although very important to us and our family, we were fortunate to escape unharmed physically. It has been over 10 years since that quake, every year a learning experience. The fortunate ones who do survive disasters find much strength in the old and the new. The support of people like those who have posted here are the new building blocks of hope. The old are usually the memories of the lost. Memories are never really lost and will be with you to help build your hopes. I truly believe that things are just that and with memories and support of others you hope for a bright new beginning. I heard last evening from IJP (with whom I correspond privately)one of our members. I am sure he will not mind my posting this update on his safety. Ian is alive and well, although he lived without water or electricity for ten days, before being compulsorily evacuated by the US military on Wednesday. I am sure you will join with me in rejoicing for his safety, but commiserating on his discomfort, fear and loss or property. Good news -- safety is the first priority. Thanks for the update, Tom. This show of heart-felt concern truly is amazing, and I've found that in the U.S. as well as worldwide, everyone I have encountered is willing to lend whatever assistance they can... It comes much needed to many, and is appreciated by all. For the first few days, I ventured out into the town to view how seriously we were hit, and the wind damage evident in my neighborhood was typical across town, again, nothing major. It was by Tuesday night, I think, that flooding became a serious problem, following the levee breach that I'm sure everyone heard about ... (During all of this time, having no electricity and having lacked the foresight to get a radio and batteries, all of my news was by word of mouth). The flooding was extensive, but never reached my neighborhood. To blakstone: I went downtown to the French Quarter where you work, and it was dry when I visited, and all reports were that the French Quarter was not affected by the flood damage. I do not know where you reside in town, but to my knowledge at the very least, most areas within a quarter to half mile or so from the River remained above water. Day by day, more and more people chose to evacuate through the Superdome and Convention Center... I have to confess that one reason that I never considered the designated shelters as an option is precisely because it seemed inevitable that they would be hotbeds of chaos and restlessness. (When the storm was impending, I knew I would be very much safer and more comfortable in my apartment on the second floor of a converted and partitioned ante-bellum house, which naturally survived Camille and Betsy among countless other hurricanes). Before long, the city was virtually empty, with relatively few people around. Yet of those few people, quite a proportion were criminally inclined, to say the least, and in addition to the needless looting (of Saks Fifth, for example) and arson (of Saks once again, among countless homes), each night there could be heard gunshots far and near through the silence of the night. You all have heard, I suspect, of the senseless shootings at helicopters and levee repair contractors, etc. Needless to say, I didn't dare go out at night, and in those final days, in a combined apprehension of both violent criminals and the growing spread of rumors of a soon-to-come forcible evacuation, I hardly went out at all. Of course, safety is first, and if I were in an area threatened by toxic wastewater or some other danger, I would certainly be willing to leave. But my home was secure and safe, and my food and water supplies were plenty, so I was simply going to wait out the situation... Even if Orleans Parish (the "county" in which New Orleans lies) could not resume normal operation for months, the word was that Jefferson Parish a mere few miles away, would open in a matter of weeks, and it was my every intention, through contacts I had made, to remain in the area until Jefferson opened, and begin working there at a temporary job that was all but previously arranged, until such time that I could return home and return to my regular job in New Orleans. But alas, on Wednesday morning, the 7th? of September, the State Police and the U.S. Army were at my door and ordered me to pack my things and follow them to transport (Thankfully, because I had heard the rumors of forced evacuation since the prior weekend, I already had a bag packed--I can't tell you how many of the individuals ousted from town that day, were carrying what few belongings they could immediately gather into plastic garbage bags or other make-shift "luggage"). So they shipped me to South Carolina, and put me into suitable lodging, and have fed me, and given me relief and assistance resources, etc. etc. In the meantime, I wait. Man, I just can't wait to go back home. As a side-note: There is currently a petition being signed by members of the Uptown community of New Orleans (in which I live, and which as noted earlier was not as seriously affected as other areas) to expedite a modified re-opening of Orleans Parish, so that at least those persons living in regions that are above water and only superficially affected by the storm, may return home as soon as possible... I think we're shooting for a month or so from now. As the French Quarter is in a similarly stable condition, I am certain that if this petition does not apply to the downtown area as well, that FQ at least has its own petition. I am so glad to hear that you are OK! I have been concerned about you and inquiring privately with forum moderators regarding your safety. Your story is amazing (and, I will let forum members know, reflects the true New Orleanian spirit). I suspect we'll have tales to tell when next we meet, which I hope will be soon. I, too, am eager to return to our magnificent city and help rebuild it. Glad to hear you are safe and sound and hope you can return soon! To all of you survivors a very heartfelt God Bless now and always! You give us all hope since our family is still waiting to hear from several of our friends in New Orleans. The last communications we had were that they were too late to get out ( some with pets) & were asked to sign papers & were given life jackets. We have heard from some others & they are OK for now. We just lost 3 of our family members suddenly here at home so it has not been the happiest of times which is why I have not been online. We will continue to pray for all of you & donate what we can to assist you in recovering from this horror. Your great Southern spirit I know will take you all to the heights needed to get you through this. Like the Phoenix you will rise again. I've been thru 9-11 with a son who was had just returned from San Francisco (where I was fearful of eathquakes) I was thrilled! Then as he was going to work he saw the planes hit the Twin Towers. The papers from Canter Fitzgerald were in his yard when he finally returned home ...............but thank the Lord he & his friends were safe too. New York is & will be back & so will you & you too will be going home again! we will be there for you for as long as necessary. Let us know how we can help further. I will cry no more forever........! I admire the gumption of IJP. If you need a place to stay other than a community shelter, I can offer a furnished studio apartment in Montreal that I would be pleased to loan to you. Lots of clean water and a French ambience to help palliate your homesickness. Once again, I am very grateful for everyone's concern and enthusiasm to help each of us affected by the hurricane. I'm also very pleased that I can now rejoin the forum, while I have access to the local community center in South Carolina. ...In any event, the accomodations here are surprisingly good. You may all have heard that the Red Cross has launched the biggest ever mobilisation of resources in its history, in response to this hurricane disaster. Their assistance will give everyone enough time and resources to square everything away, and soon enough return to their lives. You're very welcome. Your positive attitude will undoubtedly help you get through this ordeal. I admire your courage and determination. Please don't hesitate to give your contact information should circumstances change and you feel in need of different temporary housing. Best regards. I too am glad to hear of you all being OK. I hope you can return to your homes soon. It's nice that you can still visit the forums during these times. What part of South Carolina are you in, IJP? I heard that some affected by this hurricane may be coming to Asheville, NC. about 45 minutes from where I am. I wish the very best for all of you involved in this. welcome back... Don't know you yet,but your courange is impressive and like the others am happy that you have gotten back with the silver forum family. Just wanted to let everyone know that I have returned to my home and found it in very good shape: no flooding, no damage, roof intact. I have power and potable water, but no phone or internet, so it might be a while before I can regularly check & post here. But my library is intact and I hope to return to regular visits in the near future. Many, many thanks to all who expressed their concerns and good wishes. Good news about your home and library, Blakstone. . . now, how did your employer's gallery fare (i.e., are you still employed)? I returned to New Orleans, and to my regular job, in early October. I see quite a bit of silver during my workday, and among such circumstances I often take in silver for customers to have their pieces cleaned, polished, restored, or repaired... The immediate needs of some residents met, they have begun to tend to less urgent concerns, among them their silver collections. I am staggered by the sheer volume of silver services that have been brought in. Having been submerged in floodwaters for some time, then left exposed to the elements, these pieces are in some of the worst shape I have recently seen. I don't know what was in the water (does anyone, really? ), but it certainly wasn't good to silver. The pieces come in black, and sometimes pitted. Stainless steel blades fared worse. Many knife blades are corroded, with significant pitting and sometimes with chips broken off. They certainly weren't kidding when they said to beware the floodwater. If they were so unkind to such material objects, one can only imagine the hazards to people. Well, perhaps the flooding was also an opportunity to reexamine silver that has been long stored away and forgotten - tack on a cleaning/repair bill to the insurance damages. To ascribe all tarnish and damage to the flooding would be naive. Point well taken, salmoned. I'm more than certain that there is a healthy-sized camp of opportunists out there, as probably is in any such situation. Yet I do point out that we are being inundated with silver in the most atrocious condition I've lately seen. Many of these pieces are coming from the flooded Lakeview neighborhood, where houses were nearly if not fully submerged. Collectors have had to pick through the debris to find stray pieces, which often they never do. Of those that are discovered, it's evident that they were exposed to something and left to corrode. No one can say with any certainty just what was in the stew that covered eighty percent of the town. Wasn't the floodwater saline? Salt is one of the worst things to have in contact with silver, and will produce precisely those kinds of problems -- blackening and pitting. If things got wet with salt water and then sat allowing it to dry and crystallize out on the silver, I'd imagine the results would be frightful. Stainless steel, too, unless very high grade, is attacked by saltwater. FWG: I believe you're exactly right. Another instance of my not seeing the forest for the trees. Clearly, it is precisely the saltwater that was so devastating to the silver I'm seeing. Though a blend of pesticides, motor oil, industrial paint, and general waste in the wash could not have improved matters, either. Many wonderful items were destroyed by the Mississippi river flood of 1993. For example gold was eaten off china. There was something very corrosive in the water to do this. Another fallout was after the flood the antique market seemed to disappear. We were living in St. Louis at the time and the shops all of sudden had a hard time buying new things. I never did understand why that would happen. The flood certainly was widespread, but really did not affect much of St. Louis. Perhaps people hang on to their things longer after a disaster. 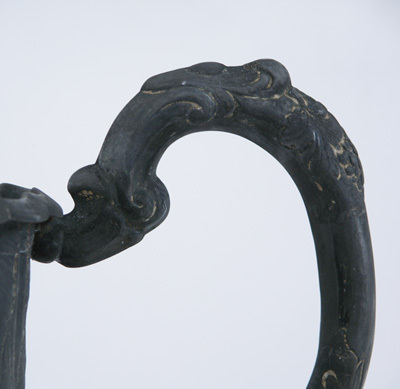 One might speculate that sulfur in the various petroleum products in the pollutants might have contributed, forming sulfuric acid, which is destructive to silver. Certainly the electrolytes in seawater would create an environment for electrolysis, but something additional must be necessary, as silver items have survived hundreds of years of submergence in sunken ships (eventual burial under cold, anoxic conditions in the sea bottom enhances preservation, but still objects would have been exposed to seawater for longer before burial than they were in New Orleans). The extemely warm temperatures that prevailed after the Hurricanes could have accellerated the process. It's nice to see such a warm and friendly community here & great to hear people are surviving! Our heart goes out to everyone touched by these natural disasters we've been having; from hurricanes to earthquakes. People are still bringing in damaged silver by droves. I just wanted to show everyone a particular piece that came in, and its condition before I have it repaired. 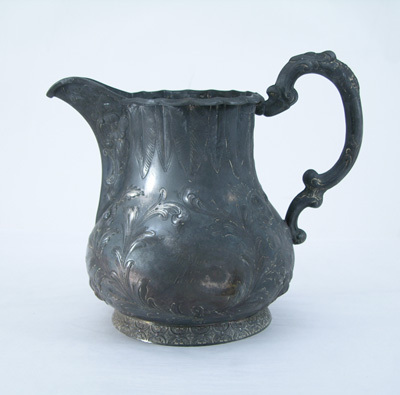 This is a New Orleans coin silver water pitcher by the celebrated silversmith Adolphe Himmel, about whom you can read here. Wasn't the floodwater saline? Salt is one of the worst things to have in contact with silver, and will produce precisely those kinds of problems -- blackening and pitting. If things got wet with salt water and then sat allowing it to dry and crystallize out on the silver, I'd imagine the results would be frightful. 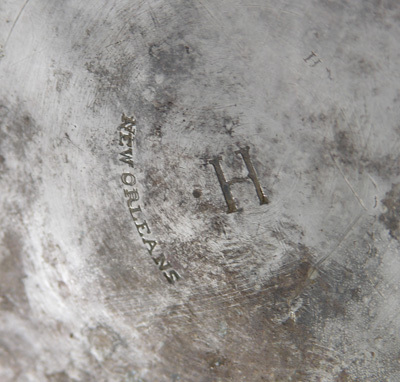 Here's the mark "H" used by Adolphe Himmel, used most frequently, I think, on pieces retailed by Hyde & Goodrich. There is also the mark "NEW ORLEANS". Though it's sad to see such a fine piece in such terrible condition, I'm confident that it will be restored in the best possible manner.